One of the most unusual military vehicles of the last 35 years, the Irish-designed Timoney 4x4 Armored Personnel Carrier did much to change the rules of AFV design. 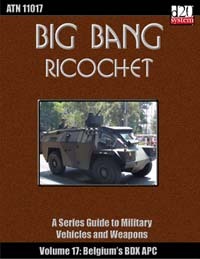 It was a very unusual vehicle, pulling back from the ever-increasing number of wheels placed on APCs, providing the driver with large, bulletproof windows for high visibility, rather than the typical periscopes and hatch, and providing firing ports for passengers, uncommon on any vehicles outside the Soviet Union. While the Timoney 4x4 APC did not find any significant success in its Irish homeland, it did find success elsewhere, with the designed licensed for production in Belgium as the BDX APC. A total of 128 units were purchased between Belgium and Argentina. In the last decade, the BDX has gained a legacy it shares with WW2 Allied military vehicles; a second life. Much like the Shermans, halftracks and jeeps of WW2, the BDX has found new life as a second hand military vehicle sold to a less wealthy government. As of 2002, Mexico had obtained and refurbished 95 BDX APCs from Belgium, deploying them as part of their own regular military.